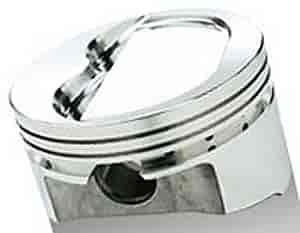 SRP SRP Inverted Dome Pistons for Small Block Chevy Bore 4.030"
Inverted dome utilizes radius tooling to eliminate hot spots. Symmetrical valve reliefs for universal installation. Valve reliefs cut for oversized valves and most street/strip camshafts. Lower ring lands and thicker crown for increased durability. High silicon alloy for tighter piston to wall clearance. Can be used in small blower and nitrous applications. .927'' x 2.750'' x .150'' straight wall carbon steel wristpin (130g) included. 1/16, 1/16, 3/16'' ring grooves.